soundimageplus: Fuji X-Pro 1 ISO test and comparison with NEX-5n and GX1 plus a remarkable sensor performance. Fuji X-Pro 1 ISO test and comparison with NEX-5n and GX1 plus a remarkable sensor performance. This is a 3-way test between the X-Pro 1 + 35mm f/1.4 lens and a Sony NEX-5n + 18-55mm and a Panasonic GX1 + Olympus 12-50mm lens. Shot at f11 on all lenses, tripod mounted, standard jpgs. Please note:- This isn't a sharpness test. Having said that, the zoom lenses on the Panasonic and Sony are around their best at f11 when used on a tripod, and as you can see at the lower ISO's all of the cameras produce pretty sharp results. As you will also clearly see the X-Pro 1 is significantly better than the other two 16MP cameras at high ISO's. In fact it quite remarkably produces a useable ISO 25600. The GX1 doesn't have that setting, which is probably a good idea once you see what it produces at ISO 12800! The remarkable X-Pro 1 result shows a file at ISO 25600 that is still sharp and doesn't break up and destroy detail. I'm convinced that images from the camera at this setting would be capable of producing a pretty decent print, which is unprecedented in my experience. The other extraordinary thing is that for the first time ever I can report a camera has recorded what I put it front of it as a test subject 100% accurately. ALL of the colours are right. My red Stratocaster is spot on, as is the camera case. Finally a camera correctly records the colour of the table I use (£8 from IKEA!) and the wall with total accuracy. Whatever I and others say about the camera in operation and use, there is no doubt whatsoever in my mind that this is a truly amazing sensor. And I repeat again, the best I've ever used. 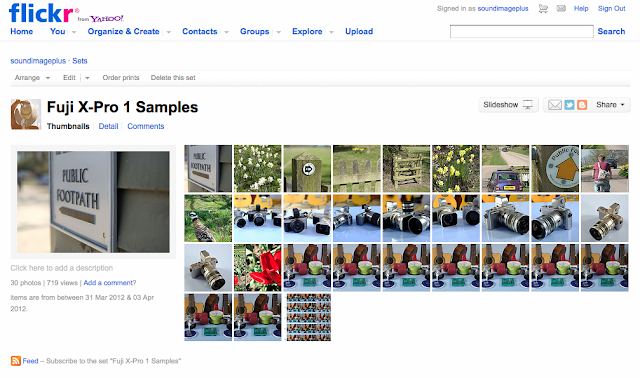 I've uploaded all the out of camera jpgs. full-size, to the sample set on flickr. Feel free to download these to see them in all their glory. But please remember they are copyright images. Though what we are both saying is critical of the mechanics of the Fuji, we are also saying that the results this thing produces are of a very high standard. From my point of view I would never have imagined that the sensor would be this good. With the 35mm lens I am consistently getting total colour accuracy. I've never seen this before, and to be honest I didn't actually believe that it was possible. I've also never seen a better ISO performance. The incredible thing is that there is no noise reduced mush here. Take a look at the ISO 25600 file and blow it up to 100%, sure there's noise, but look at just how much detail is retained. All of this without an AA filter. Astonishing. Whenever somebody came up with comments about the Fuji being "better" than a Leica M9, I would instantly get my hackles up and dismiss their comments as ridiculous. However I might be changing my view. Certainly not on the body, the build quality and the operation of the camera, as its nowhere near a Leica in those regards. However I have always regarded the Leica M9 sensor as the best I have used. Not any more. The Fuji X-Pro 1 sensor is a truly innovative thing and records incredible detail. This makes me impatient for two things. Firstly my adapters to arrive so I can try my Voigtlander lenses on it, and secondly a version of Adobe Camera raw that supports it so I can see just what I can get out of the raw files, without having to use Silkypix, which is OK, but no more than that. I still resent having the camera dictate to me rather than the other way around in operational terms, and there is certainly much Fuji need to do to earn that "Pro" tag, but there is no faulting their sensor technology. They are apparently still interested in a partnership with Olympus, and I'm really hoping that at some point Olympus (or anybody) will design and make them a decent body to house this sensor in. However I can't really see them doing this because ultimately they know they are on to a good thing and while they can charge us top dollar for the camera and especially the sensor, they will.